In 2012 Nights, Vipul Rikhi provides one possible answer to the question of what the classic One Thousand and One Nights would look like if it was told from a contemporary male perspective. In the original collection of tales, Scheherazade tells her husband, Schahriar, a story every night, but must leave each unfinished to prevent him from putting her to death, as he has done his previous wives after their first night of marriage. 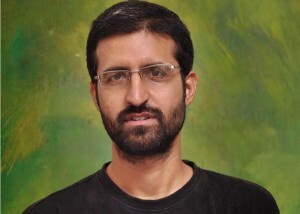 Rikhi employs many of the same structural and narrative techniques as the classic, such as the use of the framing story, embedded narratives, satire, parody and an unreliable narrator, but in other respects, his work does not resemble the folktale influences of its namesake. The urgency behind the telling of the tales is that the world is ending imminently, yet we don’t know whether this is simply the interior world of the narrator—the deterioration of his mental and physical health—or whether he really is living through the end of days. But this ultimately does not matter, as the world that he describes in his stories, an entirely recognisable world to contemporary readers, is racing headlong into its own destruction. It is a world of rampant consumer capitalism, of US cultural and economic imperialism, of wars on terror and other undefinable hatreds and of general disregard for the long-term survival of the human race and the earth. The use of a drunk narrator enables the author to travel down a rabbit-hole of blurred images and colourful metaphors, but one feels that the use of such a speaker to make insightful comments about the state of the world was perhaps a mistake. Drunks are rarely as profound as they think they are, and Rikhi’s political and social commentary can too easily be dismissed as babble, an unfortunate result of the conflation of author and character that many readers make. Where utilising a drunk narrator worked better was on the level of imagery, as the senses relay different, unexpected material when one is inebriated. 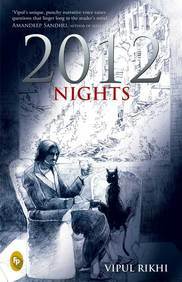 2012 Nights often felt like it would have made a good basis for a graphic novel. Indeed, the cover illustration in scratchy, contrasting black and white lines depicting a crumbling outside world and a man clutching a whiskey glass with only a cat for an audience is suggestive of the brooding, shifting world that lies within the novel. As 2012 Nights does not really tell us anything new, but does go about it in a way rich with anthropomorphic, zoomorphic and botanomorphic imagery, it seemed very frequently that the narrative would have lent itself to some form of visual accompaniment, whether interspersed illustrations or a more sustained comic book format. However, Rikhi may have been one step ahead of all of these criticisms, as 2012 Nights feels aware that its circuitousness will be torturous to some: “A world with a deluge of words but no language, Schahriar! Each crazy person is an island unto himself, trapped in his little cell, babbling things no one can hope to understand. We’re in a solipsistic nightmare. We are the solipsistic nightmare! Everybody babbles and succeeds in meaning nothing.” On this reviewer’s island, there is not much space for this particular form of babble, but 2012 Nights may appeal more to fans of experimental fiction.